Have you ever wondered how you would go about cooking your foraged or hunted food if you were out in the woods without any modern conveniences? 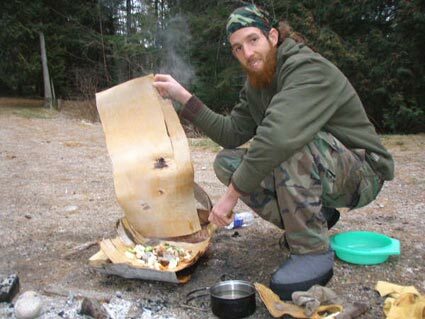 Or maybe you’d like to learn to travel a little lighter leaving your bulky aluminum and cast iron pots and pans behind. Both of these questions sparked my interest and have led to many fun experiments in primitive cooking. 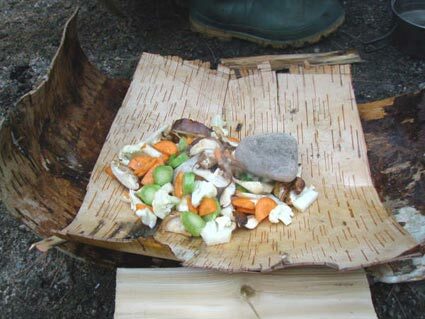 meat) using no modern utensils and thus foraging most of our materials from the near by woods. We started by finding a recently fallen birch tree that our landlord had cut down for firewood. The tree was in good health and the bark relatively blemish free. This made it much easier to peel off without puncturing/tearing holes as we went. It was fall time and after scoring the pieces we wanted with a pocket knife, they peeled off relatively easily. The White Birch (Betula papyrifera) tree has several distinct layers to its bark. We found the two inner layers just under the very papery white exterior to be quite strong, durable and perfect for our task. Next we went about gathering round rocks slightly smaller than our fists from the highlands of our property. When gathering rocks to place in a fire it is very imperative to collect them away from water sources. A rock with too much moisture in it will explode in a fire!! 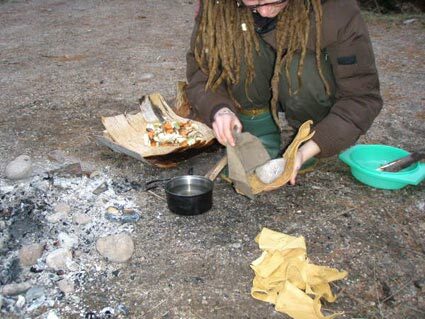 After using our bow drill kit to get a good fire going (we built the fire up fairly large to create a good coal base for heating the rocks, and to give us lots of room to place the rocks near the center of the fire) we prepared our primitive “wok”. We placed two branches approximately four inches in diameter, a foot apart from each other. We then layered two rectangular pieces of our bark in a “X” formation across the branches. Nearby we had a third piece of bark similar in size and shape to act as a lid. 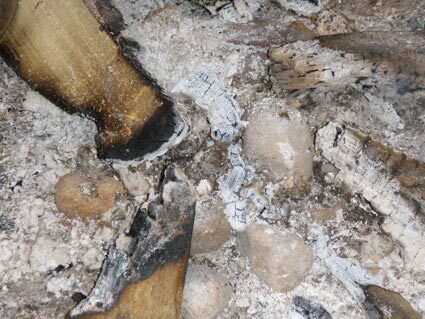 Once the rocks were heated, (we left ours for about one hour in the well developed coals), we used two wooden sticks, one with a “Y” at the end to begin removing rocks from the fire. It is very, very important at this stage in the process to make sure you have a cloth to wipe the rocks off with in order to remove mildly carcinogenic char and more important any little fragments of rock that may have began to come loose while the rock undergoes drastic temperature changes. We used a piece of leather to hold the rock while wiping it down with a cloth. Failure to remove any little fragments of rock could result in a chipped toothed when it comes time to eat your wild meal. Not a fun scenario in a wilderness setting, or any other for that matter! We added the rocks one at a time, waiting a short while before putting in the next one. It is amazing how long a well heated rock will hold its heat for. 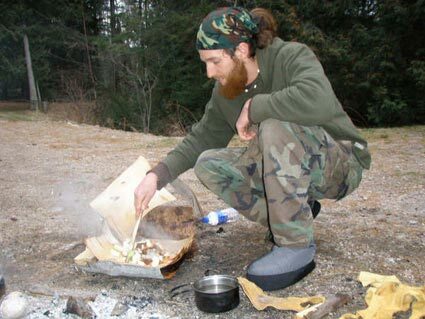 I once heated a rock in a fire and stuck it in my sleeping bag for extra warmth on a cold spring night. Ten hours later as I watched the morning sun rise it was still hot to the touch! After a few rocks were added we poured in a very small amount of water to create a steamer. Then we covered the wok with our lid and let it do its magic. Every couple of minutes we lifted the lid to give it a stir and scrape the rocks. If it seemed like the cooking was slowing down we would add another rock to the mix. Twenty minutes later we were ready to eat. Well, almost ready, first we had to break a couple straight dead branches for some chop sticks and remember to give thanks for the great food and all the lessons that came along with it. The best part of the whole experience... No dishes! When you're done just toss all your utensils right into the fire!